If you are looking for a nice little town to spend your next holidays in peace and you are hoping to be able to visit various monuments while being surrounded by nature, lovely views and great food, I have found the right place for you. Why not spend your next Holiday Vico del Gargano? This little Italian town has everything I previously mentioned and more. While spending your holiday Vico del Gargano you can not miss out on walking through the borgo antico, which is the historic centre of the town. There you will come across plenty of gorgeous churches to visit and you will fall in love with the medieval walls that surround the place. Also, if you have a chance, take a late night walk through those streets, because the yellow lights make the whole area look even better. 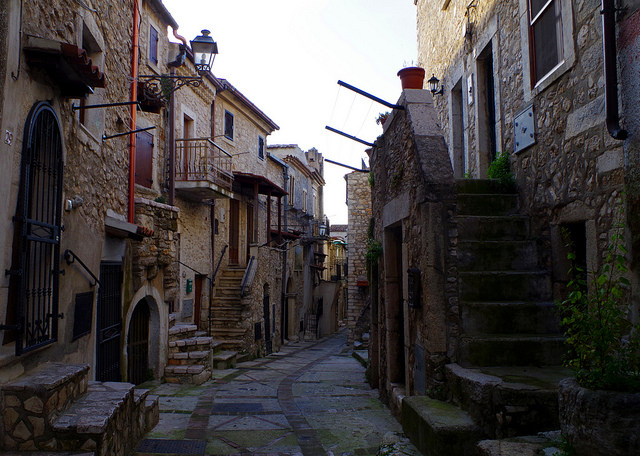 And while you walk through the historic centre of Gargano, you will come across the Vicolo del Bacio, which translates as Street of the Kiss. Why is it called like that? Because it is so narrow (about fifty centimetres) that you can’t help but walk extremely close to whoever you are with, which makes it the perfect situation to kiss. But Vico del Gargano has so much to offer to its tourists that there is even a great, inexpensive museum you can visit. The Museo Trappeto Maratea is extremely peculiar because it’s located inside a cave from the 14th Century, something you most probably won’t find anywhere else. There you will find many different items dating back to centuries ago which were used to produce oil, which is the most exported product from Vico del Gargano. And if walking around so much gets you tired and you want to sit down and relax for a bit while eating some nice, you must visit the Bar Pasticceria Pizzicato, where the most delicious homemade pastries you will ever have the honour of trying are made, all of them with the best local products such as, of course, olive oil. Your holidays in Vico del Gargano will allow you to relax, find peace of mind and also see a variety of great places, surrounded by the friendliest locals who will definitely do everything that’s in their hands to help you out and make your stay the best it could be. Discover all our offers for your holidays in Vico del Gargano.